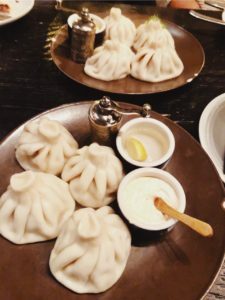 It’s safe to say that most of us don’t find ourselves thinking “Let’s go out for Georgian food tonight.” Yet the cuisine of Georgia- the country, not the state – is distinctive and versatile. 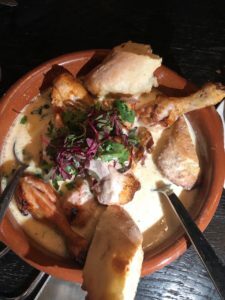 Supra, the DC restaurant showcasing the dishes of this Eastern European country, is a fun and interesting venue with lots of surprises in store for diners. Not terribly helpful. While the names of dishes at Supra may be unfamiliar, most of the ingredients are recognizable, and I’m confident in the restaurant as a crowd-pleaser. Still, some research is in order. Georgia is in The Caucasus, which also includes Armenia and Azerbaijan. Over the years, the country has sustained invasions from Persians, Greeks, Romans, Turks, and Russians, which is reflected in the cuisine. Supra in Georgian means tablecloth, but rather than taking this literally, its meaning is related to indulging in a hearty feast. Georgian food features fresh produce, meats, and grains accented with herbs including cilantro, fennel, and tarragon. The menu at Supra is easy enough to navigate once you look past the uncommon names. Its divided into sections of cold, hot, kebabs, soup dumplings, and larger plates. Many of the small plates at Supra are punctuated with walnuts or Satsivi, a Georgian walnut sauce. While Supra is the first restaurant to focus solely on Georgian food, khachapuri can be found in a growing number of DC restaurants. Here it’s center stage. Khachapuri is a traditional Georgian bread. 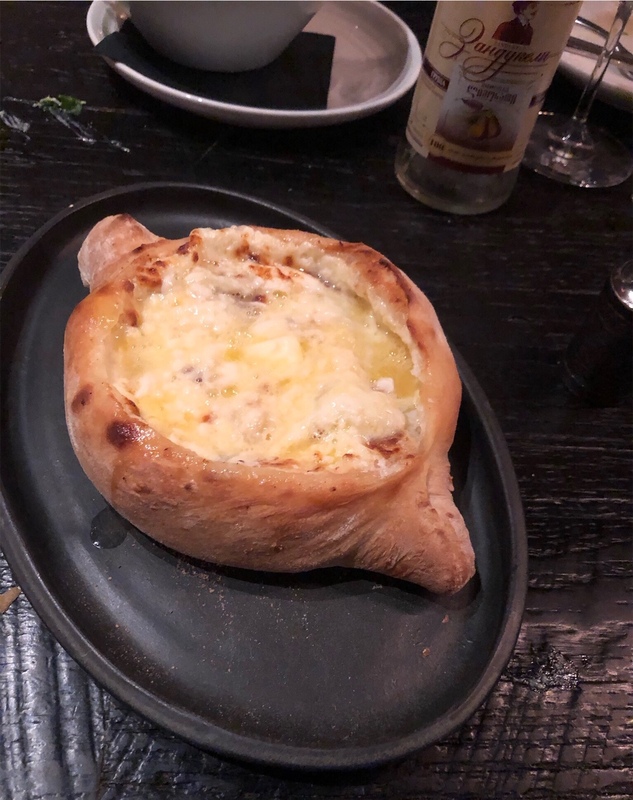 What I don’t realize when we place our order is that there are various types of khachapuri. Ajaruli is the boat-shaped version with the hole in the middle. It’s filled with hot cheese and then topped with a runny egg and butter. The raw egg is incorporated table side and swirled vigorously for dramatic effect. This is the version that Instagram users will recognize. 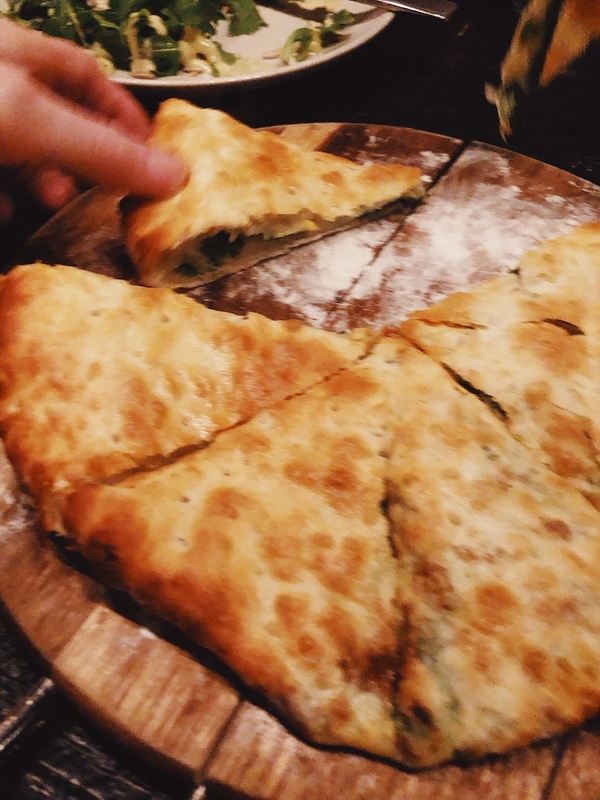 Pkhlovani khachapuri is more akin to pizza or flatbread. When it’s delivered to our table, I’m taken aback. Where is the cheese boat I thought I ordered? This version, filled with spinach and cheese, has its own crunchy appeal. I hastily request two orders of Ajaruli for the table, in addition to Pkhlovani. A Georgian feast just doesn’t feel complete without it. I’m also caught off guard at the sight of soup dumplings delivered provocatively to nearby tables. My pre-dining research didn’t go deep enough. We learn that Khinkali are the Georgian version of steamed buns. Filled with a combination of beef and pork or mushrooms, they provide another festive element to the meal. They come with instructions that are delivered with a smile, but must be taken seriously to avoid mouth burns. Our server tells us to let the steam dissipate, take the dumpling from its top knot, bite a hole in the side, slurp out the broth, and then eat the dumpling. This kind of eating is pure fun, and our group leans in to the adventure. It’s entirely possible to make a meal out of the smaller plates and breads at Supra. But then you would miss the excellent whole grilled fish. It’s simply dressed with fresh herbs, pepper-red onion salad, and nasharapi, which is a pomegranate sauce. It’s well-seasoned and well-prepared, and serves to further confirm my dining companions’ growing enthusiasm for Supra. Chkmeruli is a whole roasted chicken with a presentation that I find amusing. The cut-up chicken floats in a creamy garlic sauce, but the bowl is too small for the contents, so chicken legs and slices of bread are forced to hang off the sides. I find the flavor lacking, and thus look elsewhere for a few final bites. I find great satisfaction in Vegetable Makalze- a generous platter of Path Valley Farm vegetables grilled and served with a flavorful yogurt sauce. The seasonal selection of vegetables proves to be just the right accessory to our table. In fact, the Supra menu is brimming with vegetarian dishes featuring beets, eggplant, grape leaves, and peppers. Georgian feasts are always always accompanied by large amounts of local wine. Supra’s wine list is smartly devoted to Georgian wines. According to Eater DC, “Today it’s an important and deeply rooted aspect of both culinary and social traditions in Georgia, a country with 8,000 years of wine-making experience beneath its belt — enough for some historians to have branded it the “birthplace of wine.” Read more here. Executive Chef Malkhaz Maisashvili has more than 20 years of experience with Georgian cuisine. He served as executive chef at the Embassy of Georgia in Washington, DC and at some of Georgia’s most popular and critically acclaimed restaurants. An enthusiastic team of servers and managers help energize and inform the dining experience. Supra is a crowd-pleaser, and I’m happy to hear my dining companions discussing plans to return with husbands, kids, and other friends. White furry hats, known in Georgia as papakhi, hang as decorations in the handsomely appointed dining room. As we prepare to depart we notice a display of the hats, and borrow a few as accessories in a lighthearted group photo. I can’t think of a better way to top off a feast at Supra. *Supra is one of 19 new restaurants to be listed as a 2019 Michelin Guide’s Washington, DC Bib Gourmand. The list includes 39 DC restaurants that offer excellent food at a reasonable price.